Your pillowcase is a nasty cesspool of bacteria! Why? Your hair and face secrete sebum naturally. And when you press them against your pillow, the sebum get rubbed off and absorbed by your pillowcase; not to mention, some of you drool and sweat when you are asleep eh? As a result, your pillow become a breeding ground for bacteria. When your face comes in contact with your pillow, the grime and bacteria re-contaminate your skin and BAM! BREAKOUTS! Fix It: Change and wash your pillowcase (and bed sheets) every few days or weekly. Much like Suspect 1 — Each time you use your makeup tools, they collect and trap leftover makeup, sebum, dirts and sweat, which make a perfect flourishing surroundings for bacteria to build their colony. If you continue using the tools, you are transferring the grime and bacteria to your face thus, increasing the chances of getting breakouts. Fix It: Sanitize and wash your makeup tools after every use or at least once a week. Think about what your cell phone goes through a day. Your hands are full of germs and with all the texting, snapping, scrolling on your cell phone, plus you put your phone on the public table, toss it in your bag etc. ... all of these actions transfer a lot of bacteria onto your device, which can then get transferred to your face when you are making or answering a call. Fix It: Clean your cell phone by wiping the screen with anti-bacterial wipe regularly. (I personally use Anti-Bacterial Wet Wipes from Dettol.) Alternatively, you can consider using a head/ear-phones to reduce the chances of your cell phone touching your face. As I've mentioned before in "Clear Acne From The Inside Out", some types of foods increase oil and hormone production, heat and toxic in the body, which can cause you to breakout. Fix It: Avoid oily, spicy, junk foods and/or dairy products. Consider keeping a food diary and monitoring your skin can help you find out if a certain food is constantly causing you to breakout. Your makeup can get stained on the frame. In addition, sebum, dead skin cells, dirt and sweat get trapped easily on and under the frame too. The build-up can cause clogged pores and the growth of bacteria, leading to breakouts. Fix It: Keep your eyeglasses free from grime by washing under water or wiping them with anti-bacterial wet wipes. If you wear makeup, make sure you thoroughly wipe the areas that touch your skin with a makeup remover wipe. Well, it is more than just choosing the right skincare/makeup products when it comes to battling acne. 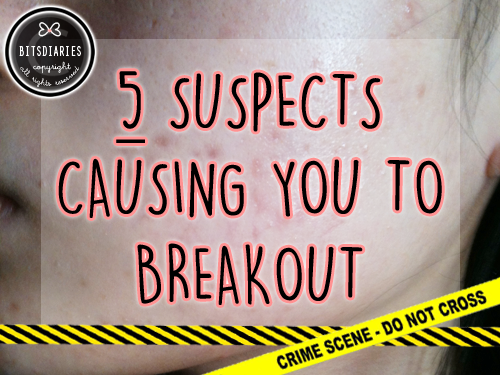 There are many "small" things that we use or do everyday might be to blame for the crime of causing breakouts — be vigilant! - "What The location Of Your Acne Is Telling You"
- "Understanding The Types Of Acne — Whitehead, Blackhead, Papule, Pustule, Cyst, Nodule"
- "Understanding The Acne Fighters — Salicylic Acid, Benzoyl Peroxide, Tea Tree oil"
- "5 Acne Spot Treatment Recommendations"